The introduction of the new Alto city car this month marks 30 years since Suzuki Motor Corporation first launched the name in 1979. A car spearheaded by current Chairman and CEO Osamu Suzuki, the model was designed for the Kei Class in Japan to provide motorists with low cost and enjoyable motoring, an ethos which has remained a core feature of the car’s DNA over three decades. This is a double milestone for Suzuki as it is also celebrating 30 years of sales and operations in the UK. Following the introduction of the first 500cc Alto in Japan, the car proved to be a huge success, surpassing the initial sales target of 5,000 units per month by over 300 per cent in just four weeks of the model hitting dealer showrooms. 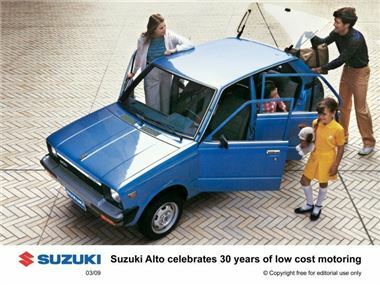 The success of the Alto sparked a massive growth of the compact car segment as other manufacturers set out to take advantage of the phenomenon, but the Suzuki remained the top selling mini-vehicle for 14 years. The Alto was first exported to Europe in 1981, and has recorded sales of 250,000 units during its 30 year presence, of which nearly 42,000 examples have been sold in the UK, peaking in 2004 with sales of 8,600 units. Mirroring the success which the car achieved in Japan, the Alto became the most popular A-segment purchase in a number of European countries. The new seventh generation Alto, now available at the 142-strong Suzuki retail network in the UK celebrates its return as one of the greenest petrol family cars on sale today. With emissions of only 103 g/km for manual variants and combined fuel economy of 64.2 mpg, the car continues to provide consumers with a product offering which combines fun, style and exceptional value for money, thanks to an on the road price starting from only £6,795. For further information on the new Alto and Suzuki automobiles range, visit www.suzuki4.co.uk.